I kept it easy and slow. Avoided burgers at all costs. Then crossed the border to get two in a row. And because I am a dumbass without a car, I had to take public transit. Hit two places that were near to each other. All the way to Kearny Mesa. 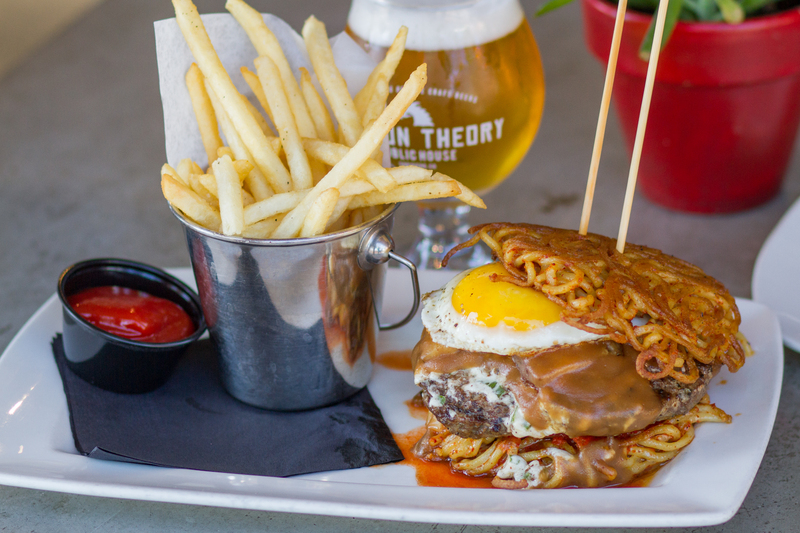 The burger here… A ramen burger. 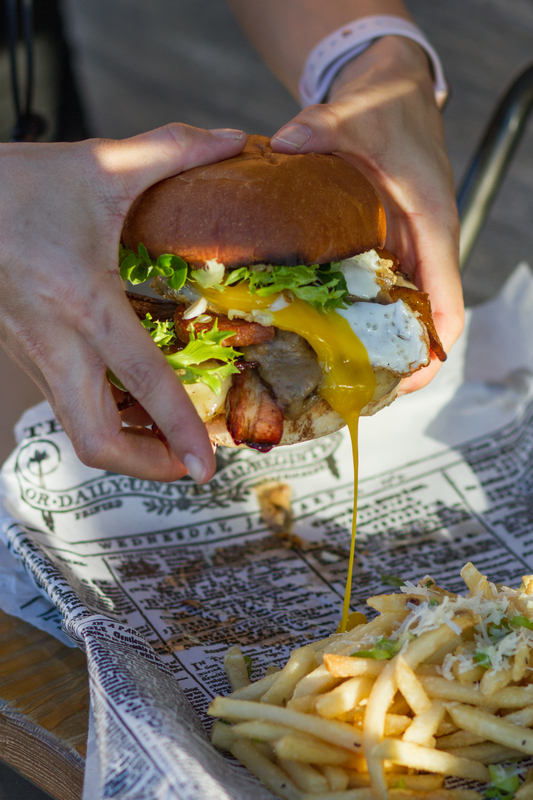 Not only a ramen burger. One with kimchi, scallion cream cheese, gravy, and a sunny side up egg. This is what that monstrosity looks like. And cutting into the egg! That is the owner poking the egg with the fork. He hovered near me for some of the shoot, which many times I actually dislike, but Cris turned out to be an awesome dude. That is his name. Cris Liang. Yes. He is Chinese. And we got talking about Tijuana… and wait a minute. This dude spoke perfect Spanish. He was actually born in Rosarito! So I guess he is Chinese/Mexican/American serving a burger influenced by South Korea and South USA? The burger is not really a burger. And it is one monstrous thing. 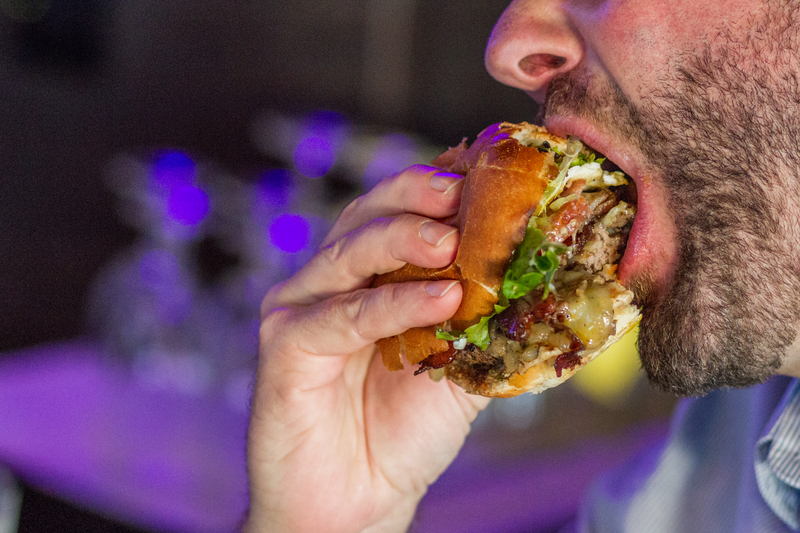 Despite that a week went by… burgers were still a bit eek to me. This one you obviously can’t pick up. It’s a knife and fork endeavor. The meat patty was delicious, the kimchi could have been more kimchish (stronger), gravy combo with scallions was great, and an egg is always welcome. 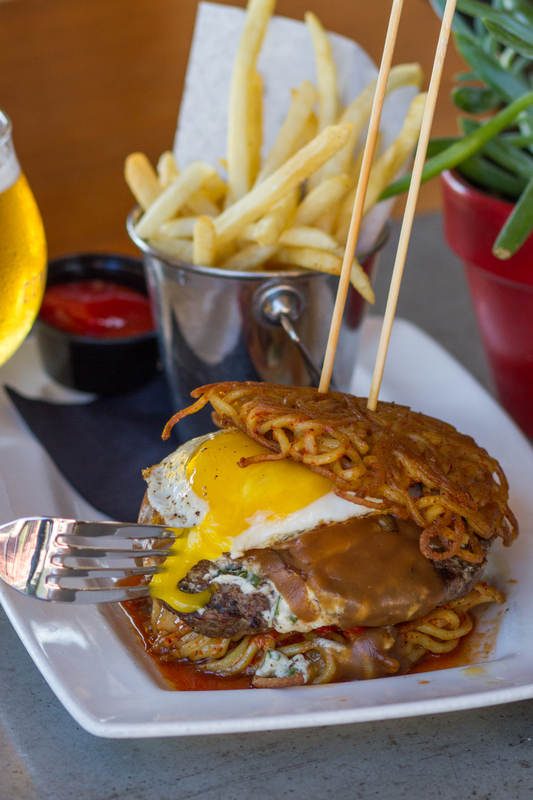 Ramen as hamburger buns… meh. Not really. I wasn’t loving it. Clever idea, but I don’t think I can call this thing a burger (even though I just did 20 times). The same thing could have been accomplished if it didn’t have a burger form. It’s very creative and awesome to look at. Doubt that hamburger buns would work, so I guess no option but ramen. It’s pretty out there. It’s pretty damn good. The place had a GIANT menu and I saw other food going by. Some chubby dude next to me was going at some fried chicken that smelled delicious. The beer/bar menu is also gigantic. A couple on a date were drinking wine to the left of me (though this place didn’t seem like a wine place). If I ever go back, I don’t think I would get the burger since there were many other options. If… I ever go back. It’s really out of the way for me. The bar is ALSO great. The place, in general, had a great vibe. Though it’s in a strip mall, it doesn’t feel like it. Definitely some of the best in the area. Because… well… that area doesn’t have much. 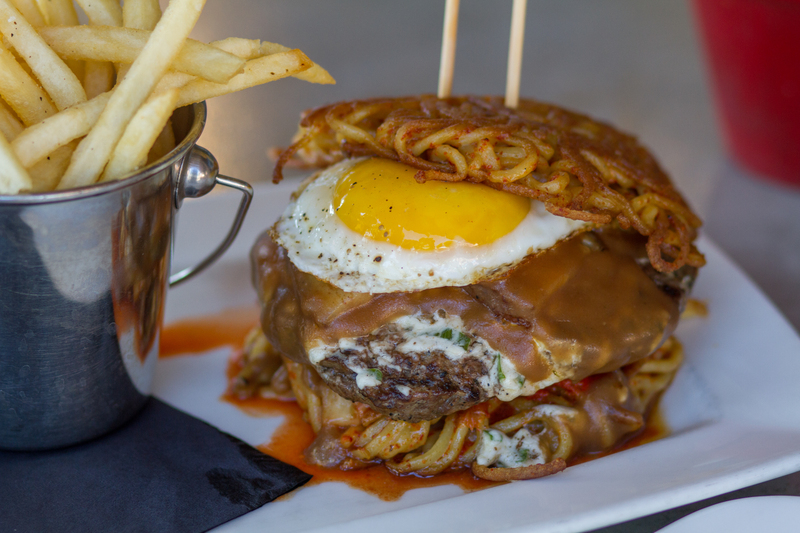 And that ramen burger would be a hit in Tijuana. This city loves its gimmicks. The whole place would be very welcome here. I didn’t finish the burger. I ate most of it. That’s very unlike me. But again, my appetite was still low. Which totally sucked, because I had another burger to photograph. I walked to my next destination. Trying to walk off the burger and get hungry again. The other place was Trade Winds Tavern. Again, in a strip mall. Kearny Mesa is an odd place. The writer got the Loco Moco. It looked like this. I’ve never heard of a Loco Moco. Apparently, it’s a Hawaiian thing. I’m not very fond of Hawaiian food. This looks delicious… but at the time, with absolutely no appetite, it wasn’t looking great. Also, it isn’t a burger. Yes. There is a burger patty in there… but come on! 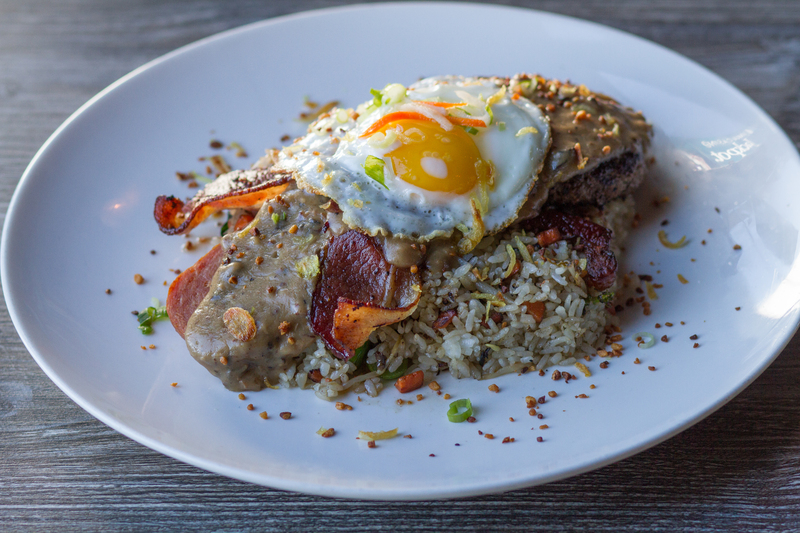 Then spam, gravy, bacon, and an egg (on a bed of fried rice). Sounds like a delicious hefty breakfast to me. Not late dinner with a beer. I was confused, especially because my assignment was to take pictures of burgers. 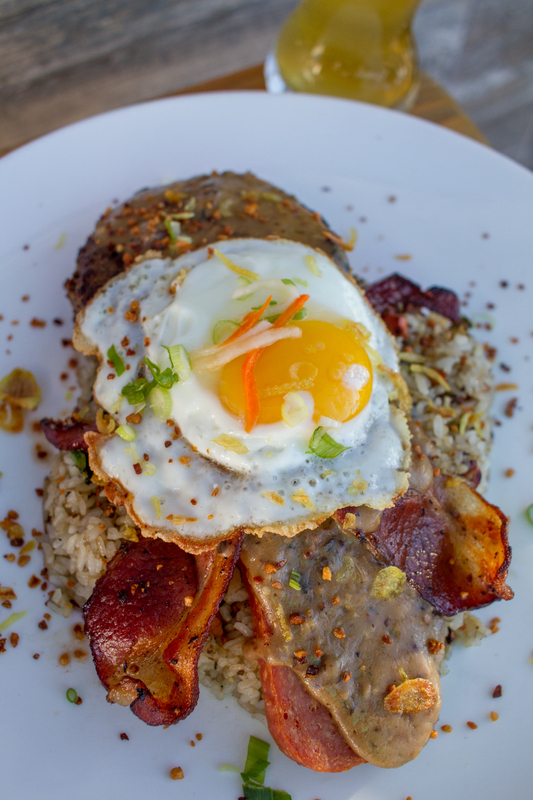 I took a bunch of pictures of the Loco Moco. Then went back to the bar and asked if they had it in burger form. They didn’t. I asked if they could make it and the chef said yes. 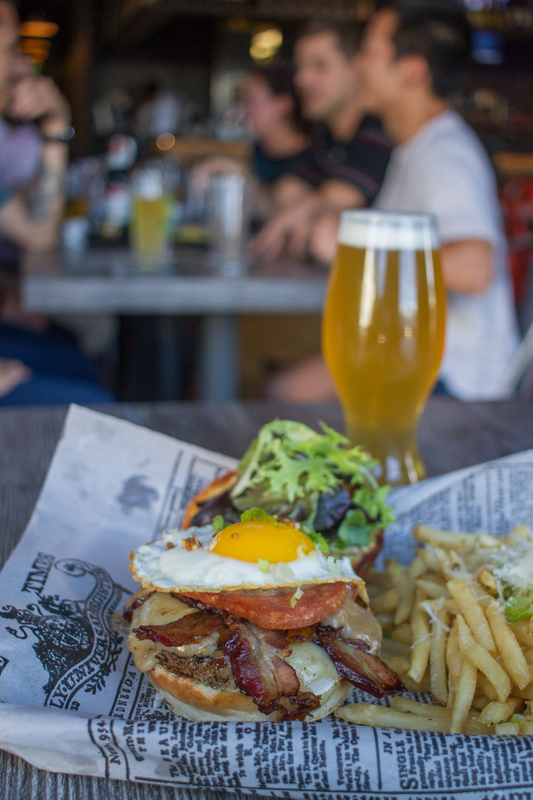 He came up with an awesome burger. Looked even better than the real Loco Moco plate. I suggest they add it to their menu. Chad came to the rescue and though he said he wasn’t hungry, as soon as I was done taking pictures, he wolfed it all down as if he was starving. And honestly, I would have too… If it was normal me. 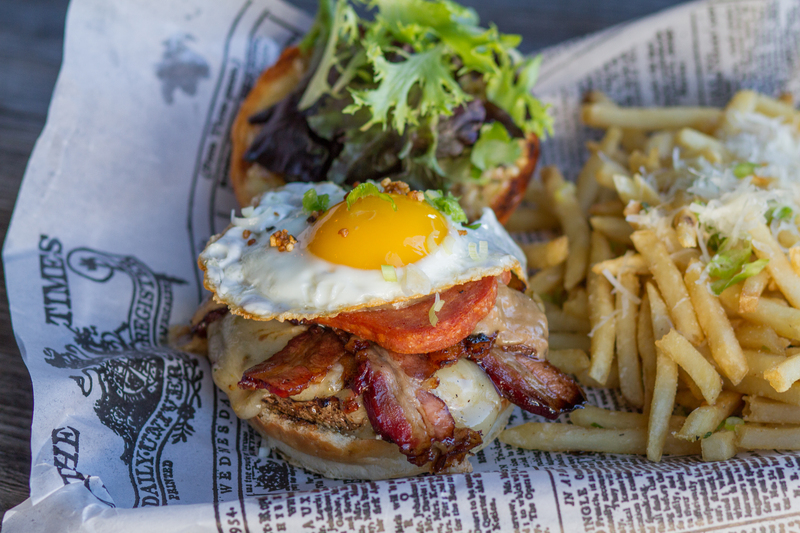 Look at how good this burger looks. I made it look good, but I trust that it was also very good. 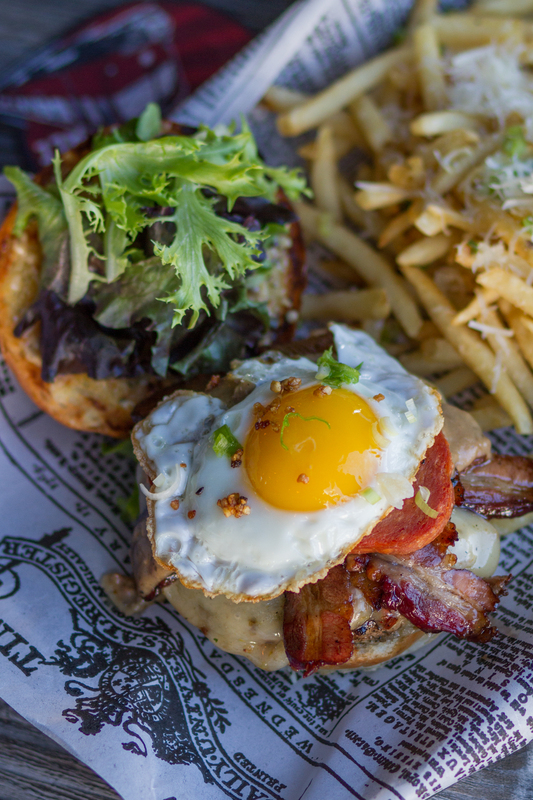 That looks like a damn proper burger. Fries with parmesan also looked great. I tried to add some scenery. The editors like scenery. 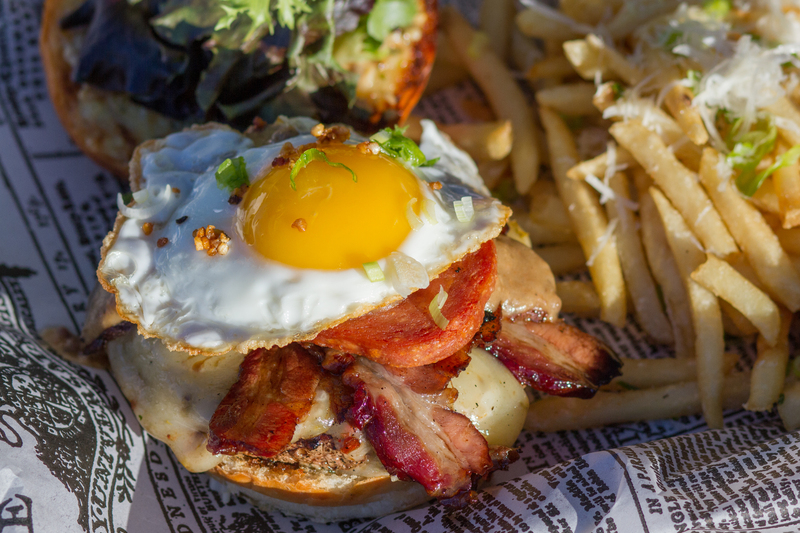 The burger glistening under the sun. I asked for some help from the bartender to do the holding the burger shot. The egg dripped immediately. That was one of my favorite pictures. I also developed a mini-crush on the bartender. She was adorable. Then Chad crushed the burger. Sorry if a bit gross of a picture. After that, we probably went to Bitter Brothers. That’s a great brewery. But writing about it will be for another time. It’s Saturday and I just had two mini Tijuana Adventures in a row. Chad came down on Thursday and I was out until 2 a.m.
Then my friend Joey came down late last night. I was up until 2 a.m. Both times, though I retire from tour guiding, I still do it. But it’s with friends. It’s different. I enjoy it like that. I actually enjoyed it with strangers as well. I’m just lazy and needed a break. My favorite burger that rescued my appetite and gave me the confidence that I will eat burgers again comes tomorrow. Burgers part 4 and maybe final part tomorrow! 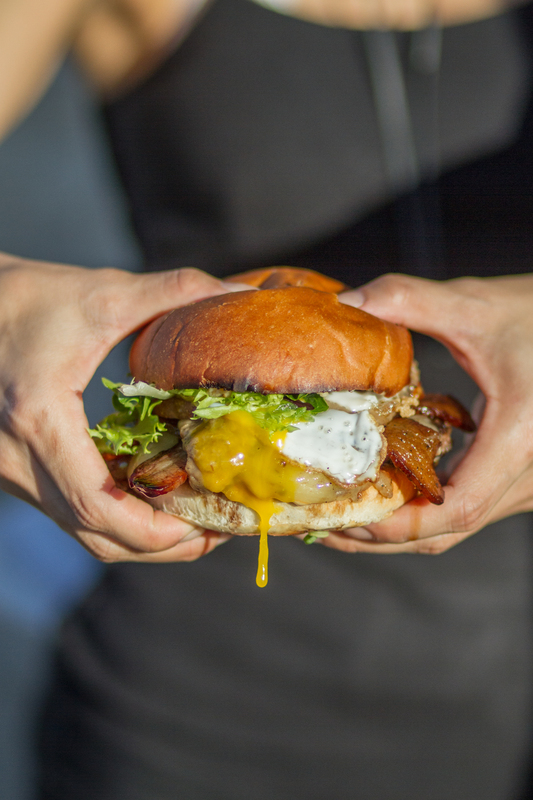 NextBurgers Part 4: Best San Diego (IMHO) Burger Revealed – Cali O Burgers, Craft House, Tom Ham’s Lighthouse – Enjoying? Let Me Know!